Karanja is a very ancient town. The town is mentioned in 'Patalkhand' of the 'Skand-Purana'. In ancient times, the north-south pilgrim route passed through Karanja. Saints, hermits, pilgrims, and other travelers used to halt here to refresh themselves before continuing their journey. Sage Karanj had his hermitage here and hosted pilgrims and travelers. He was the famous disciple 'Patanjali' of the great saint 'Vashishtha'. 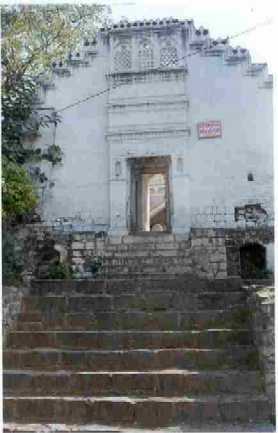 He came to be known as Sage Karanj because his hermitage was situated in Karanj-van. Sage Karanj observed that scarcity of water resources caused great discomfort to pilgrims traveling through Karanja. He started digging a tank to collect rain water as well as water flowing from nearby streams and rivers. Goddess Renuka was immensely pleased with Karanj Rishi's efforts. She blessed him that the tank would have water as sacred as that of the famous rivers such as the Ganga, Godavari, Sharayu, Tapi, etc. She blessed that anyone drinking water from the tank would invariably attain 'moksha'. The tank exists even today and bears the name "Rishi Talav". A small river, known as 'Bembla', originates in Karanja. According to local folklore, the river flows underground for a few miles, before appearing overground. The river too is of historic significance. The river was formed from the drops of the river Yamuna when Yamuna was traveling with Sun, her father. Thus, the water of the river Bemblaa is considered very sacred due to its Yamuna heritage. Nature has granted generous water resources around the town. There are ponds (small lakes), on all sides of Karanja, which store rain water. They lift the underground water levels and are also watering points for cattle, wild animals, and birds. Goddess Shakti made Karanja a permanent abode through her various avatars such as Kamakshi, Ekviraa, Chandravati (Gauri), and Yakshini. It is also stated in the 'Skand-Purana' that 'Chandra' (Moon) was asked to perform penance in Karanja to be relieved of the curse for his evil conduct with his 'Guru-patni', Tara. During his penance, Chandra built a temple for Lord Shiva and a water tank - named as the Chandreshwar temple and Chandra Talaav, respectively. Legend has it that due to the blessings of Sage Karanj, all species of snakes are full protected from their traditional enemies such as eagles and vulttures. In gratitude, the snakes blessed the residents of Karanja with full immunity from snake bites. The town boasts of several temples, some more than a 1,000 years old. Some of the more prominent ones are Shri Siddheshwar, Shri Chanreshwar, Shri Nageshwar, Shri Kamakshi Devi, Ekvira Devi, Yakshini Devi, those of Shri Ram (built by the famous Kannav Family of Karanja), Shri Vitthal, Shani Maharaj, Maruti and Shri Dattatreya. There are also a few old 'mathas'. Karanja is also a famous pilgrim centre for the Jain community. There are three beautiful Jain temples in Karanja.